Download Free eBook: "Top 10 Inventory Practices of High Performing Distributors"
StockIQ is a supply chain planning suite targeted at 3PL's and distributors. With over 15 years in the industry, we know what you need to run efficiently, improve forecast accuracy, and reduce inventory levels, while providing unmatched service to your customers and shippers. Be prepared for the future with advanced forecasting algorithms which can handle seasonality, short life cycle products, events, promotions, new product introductions, and forecasting at all levels of your product hierarchies. Order with optimized quantities and timing to ensure you have the right inventory, in the right place, at the right time. Take advantage of container loading, special pricing, inventory balancing/allocation, advanced hub/spoke and Bill-Of-Material explosion, and more. 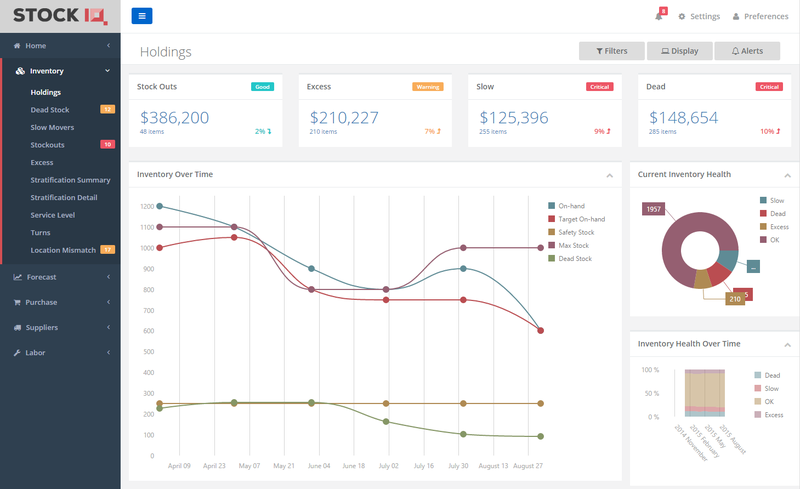 Take control of your inventory with advanced inventory planning dashboards that provide actionable data on Stock Outs, Dead Stock, Service Level, Turns, Safety Stock, Economic Order Quantity calculations, and more. Track supplier reliability and lead times over time so that you can operate to the most up-to-date and accurate lead times, letting you optimize your safety stock levels for the real world performance of your suppliers. Track promotion historical performance predict uplift of new promotions as they occur. Analyze promotions for trends and behavior, and plan markdowns for end-of-season sell-through. A well-developed SIOP process is nothing without data to support it. StockIQ's hierarchy supports all of the top-down and bottom-up data you need to be able to do your SIOP and reach consensus within your team. StockIQ is built in the browser so that it is available anywhere, anytime, and on any platform. Avoid platform lock-in by taking advantage of the modern web. More companies are seeing the benefit of managed, cloud hosted solutions. StockIQ is built from the ground up to efficiently and easily live in the cloud, letting you focus on your business. Already have IT resources in house? StockIQ is also available for on premise installations, where you can enjoy the security and control of your own data center. As a modern web application, StockIQ is at home on any form factor - Desktop, Tablet, Phone. In a BYOD world, StockIQ works wherever you are, and whatever you view it on. Packaged with StockIQ are several WMS and ERP system connectors, so getting up and running is smooth and easy. StockIQ will work with you to make sure the integration is correct for your unique situation. Reduce Inventory 10-35%. Improve Service Levels. Improve planner productivity. Tired of software that provides information but no insight? StockIQ leads you to the answers so you don't have to find them. Software Solutions are only as good as what you get out of them. StockIQ Improves your bottom line, and gives you happier customers. By accurately forecasting your items and setting statistically based safety stocks, stock outs are reduced. Gone are the days of only being able to do your purchasing once a month. StockIQ allows daily optimized purchasing for maximum responsiveness to a dynamic world. By providing standard tools with best practices built in, StockIQ helps get everybody working most efficiently towards optimizing your inventory. Eliminate Stockouts, eliminate excess, and reclaim warehouse space for more products or clients. Experience has shown that distributors, manufacturers and 3PL's alike can enjoy 10-35% reduction in inventory levels, all the while improving service level. By focusing on providing you answers rather than features, StockIQ helps you find and solve problems quickly. What are we going to sell? StockIQ's replenishment engine handles any scenario you might encounter - short lead times, long lead times, demand patterns, special pricing, supplier minimums, container loading and more. Planners create their orders with a few button clicks, and StockIQ handles the rest. StockIQ exposes dead inventory so that it can be dealt with, so you can make room for items that will bring in more profit. What are we out of? StockIQ prioritizes stockouts and projected stock outs by lost sales or revenue per day, so you can target the most important shortages first. What are my most important items? With advanced, multi-dimensional ABC and XYZ inventory stratification, StockIQ allows you to define target service levels and slotting approaches for the items in each warehouse, and for each shipper. StockIQ's sophisticated, statistically based methods for calculating Safety Stock allows you to define safety stock, target stock, and max inventory levels. Am I meeting service level targets? By tracking orders and shipments, StockIQ gives you immediate visibility to service level and fill rate performance for your items, shippers, sites, and buyers. Distributors, 3PL's, and Manufacturers alike live by their inventory turns. If it's not turning, it's not making money. StockIQ highlights items that are furthest from their target turns, so you can investigate and fix the solution. Get a demo of StockIQ today to see just how much StockIQ can show you about your supply chain.